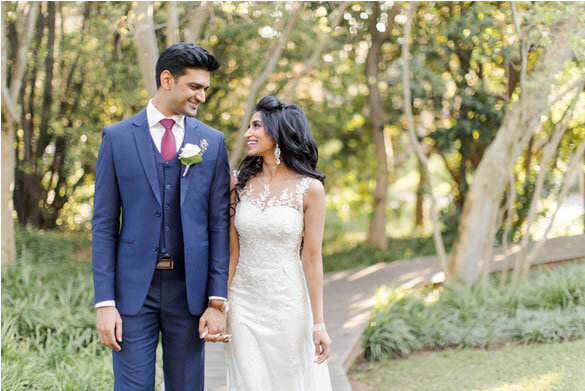 Many people would never admit that they met on social media, but for Rushani, she unashamedly says Ashley caught her eye on Facebook; under the ‘people you may know’ section. She thought that he was way too good looking to be single, and after hesitating for a while, she took a leap of faith and eventually messaged him, obviously not expecting a reply, but, surprisingly, he did!! Soon after they met for coffee and Rushani says the connection was instant and comfortable and they couldn’t stop chatting and ended up closing the place down. Three years later, on their anniversary, Ashley requested that Rushani get ready for a date and that he would collect her around 7pm. As per usual, she got ready in her room, loud music playing, excited to see him; she then sent him a message to tell him she was ready and waiting. As she opened the door, to her surprise, there was a trail of red petals down the corridor, and at the end of the corridor, all suited up was Ashley. At this point in time Rushani was still under the impression that it was their usual anniversary date, and had no idea that this date was going to end in a proposal. After the meal, Ashley mentioned that he had a gift for Rushani and presented a leather album of all of their memories from the past three years. At the end of the album, he had written, “and here’s to the next chapter,” but for Rushani it still didn’t click until he went down on bended knee and popped the question. Rushani says she was in complete shock and did not expect a proposal at all. Their vision for their wedding venue was to host something classy and elegant, and hopefully an experience that their guests would not have had before. 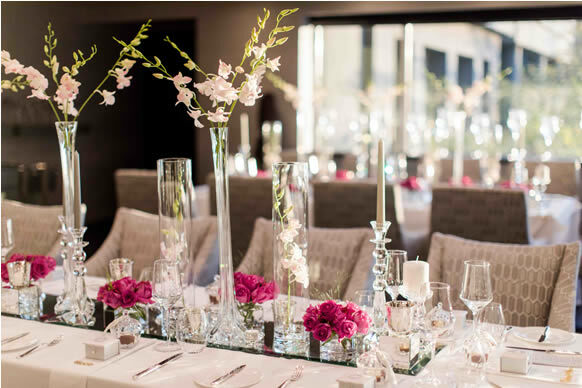 After visiting many venues, The Grei Restaurant at The Saxon Hotel stood out for them as it provided everything they were looking for: impeccable service, a fine dining experience, and everything in-between. They describe their wedding as mesmerizing. When asked about how they put their day together, Rushani says they created their own personalized invitation, which was unique to them. She remembers it was quite a lot of fun putting it together as a couple. The invite itself was elegant yet simple. For the evening they wanted something classy and stylish, something which was an escape from the norm, and something that would be breathtaking and romantic when their guests first entered the reception room. There were two parts to their wedding day; the first part was the ceremony, where only 15 family members and guests attended a small venue called Simply Wed, where they took their vows. Simply Wed is the beautiful alternative to Home Affairs. 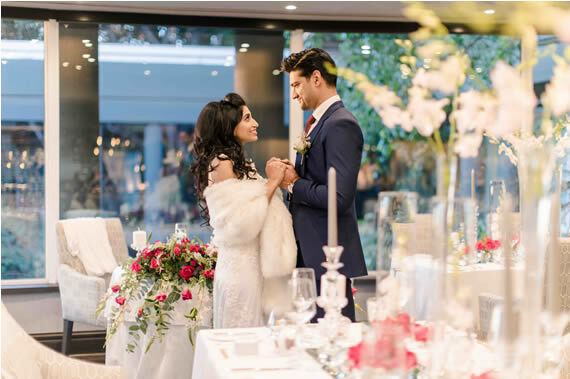 It is the ideal option for modern couples who want a no-fuss court wedding, but still wish to share the special moment with their closest friends and family. The second was the reception where the rest of their guests joined them to celebrate their union as husband and wife, which was hosted at The Grei. 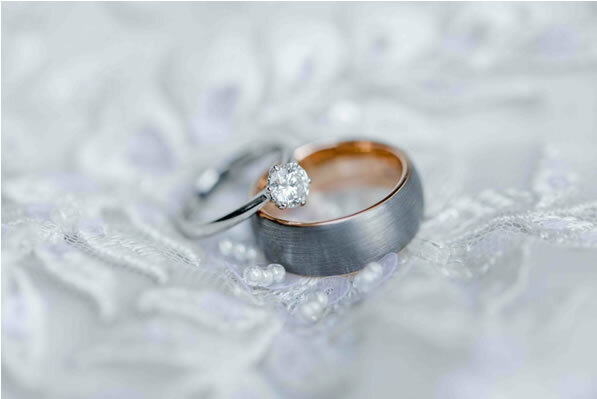 A few key elements were considered important to this couple when planning their special day. This consisted of the ambiance, the décor, the food, and the flow of the evening. They chose a two piece string band called the Rocketeers to set the atmosphere, the chef at the venue nailed the food and wine pairing and the flow of the evening was just perfect. The decor was dreamy and Rushani says it really had a breathtaking effect. 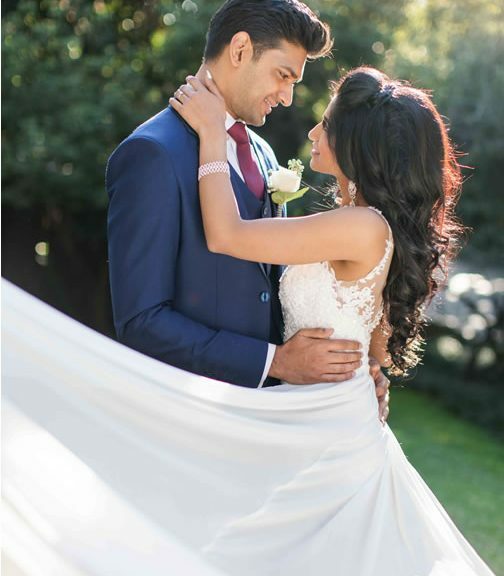 To achieve her wedding look Rushani says she found her gown soon after her engagement and what she loved about it was that it was simple yet elegant. 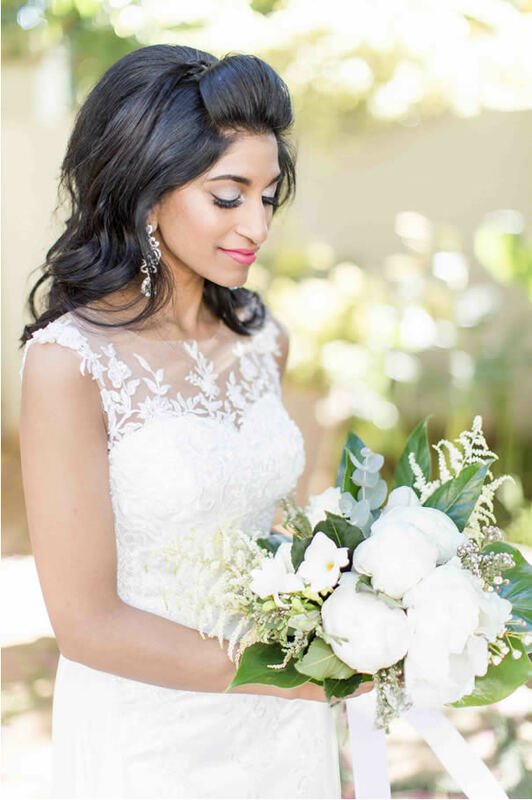 She fell in love with one of the unique gowns, which best suited her needs, look and feel of her day as well as her bubbly personality at VonVé Bridal Couture. Her beautiful dress celebrated the romanticism and sensuality of her wedding day. 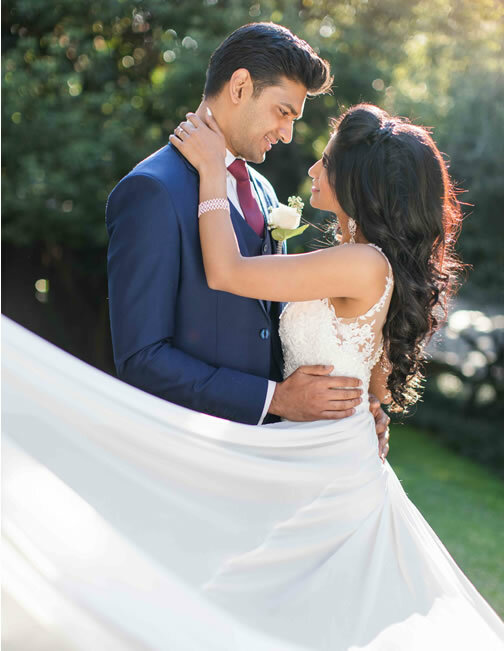 VonVé offer professional styling and they advised Rushani to wear this soft and classic ivory coloured gown which highlighted her petit silhouette and skin tone, making her glow and look gorgeously radiant. VonVé offer their brides only the most luxurious fine lace and ultra-unique feminine designs that meets the best quality fabrics. Rushani has gorgeous long hair, and her vision was just to add some volume to it. She was very happy with the makeup artist she found, and says that any look she gave her would have been beautiful. Ashley on the other hand, looked decidedly dapper in his suit which he choose from Tip Top Tailors. He advises grooms-to-be, looking for something awesome to wear, to pop into one of the many branches Tip Top have around the country, for excellent and unsurpassed service. For their wedding favours, both families assisted in bringing something from each side. 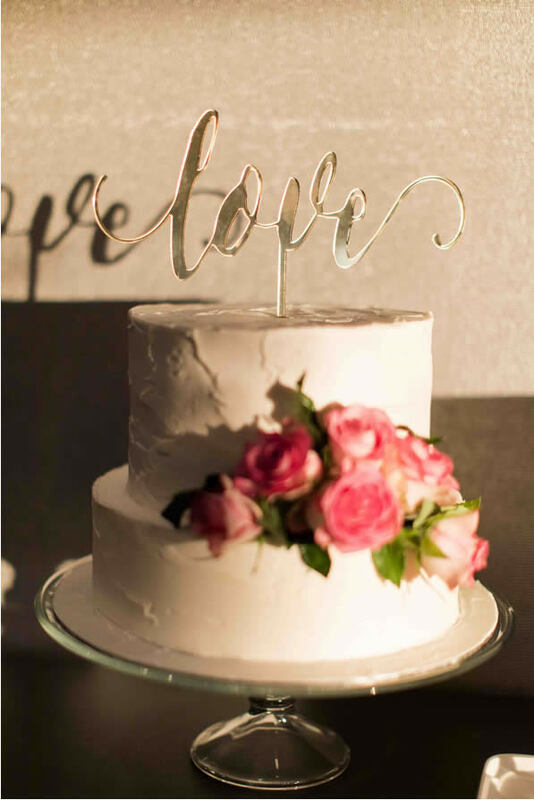 As Rushani is originally Sri Lankan, her side of the family provided each guest with a piece of traditional wedding cake made by her mom, placed in pretty boxes from Sri Lanka, and Ashley’s side of the family placed Indian sweetmeats into pretty glass jars for each guest. A very unique idea from both sides of the family!